Our Products >> .50-95 Winchesrer, Limit One Single Cartridge per customer! Strict Limit of One Cartridge per Customer, on this item. One Cartridge not a Box! 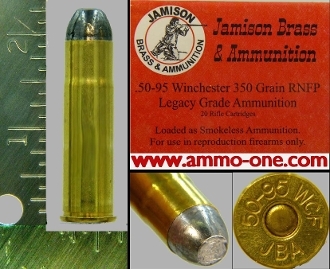 : .50-95 Winchester, by Jamison USA , Made from new brass with “50-95 WCF JBA” Head-Stamp and a 350 grain Lead projectile. "Live", loaded with smokeless power. History of .50-95 Winchester Cartridge: *50-95 WCF. The 50-95 WCF or 50-95 Winchester Express was introduced in 1879 for the Winchester 1876 Centennial Rifle. The cartridge is an improvement on the 50-70 Government Military Cartridge, with a very slightnecked case. It has been obsolete for well over 60 years, accept from a few small companies. *WCF = Winchester Center Fire. .50-95 Winchesrer, Limit One Single Cartridge per customer!